Santa Baby was born out of the need to find my Christmas spirit. I love Christmas; it is romantic, it is full of love, family and traditions. For me, much of this sentiment disappeared amid the loss of our home in February to a fire. With all of our mementoes gone, I felt myself struggling to find where it all fit again. 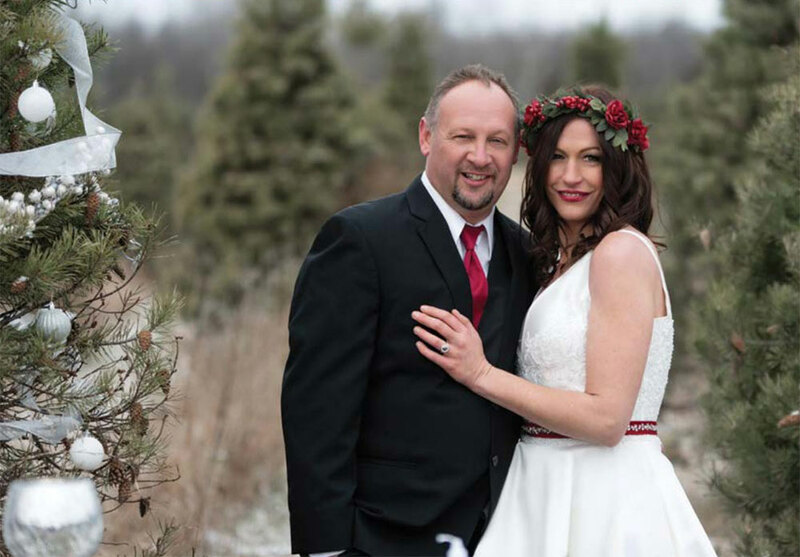 Since I married my husband on December 13, we had a Christmas wedding. 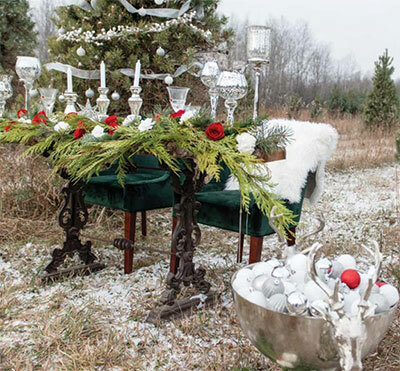 I loved every ounce of the day and thought maybe a wedding photo shoot with a yuletide theme would help me recapture some memories and some of the missing spirit. I’ve always loved the song I Saw Mommy Kissing Santa Claus and the song Santa Baby, especially the line about a ring! So, I dove into the idea of recreating a love story about Santa kissing mommy and presenting the ring. Once the scenario was established, a beautiful tree farm was needed, and Blitzen Estate in Jasper, Ontario, fit the theme perfectly. The tree was decorated, the fire was lit, the table was set, and Santa flew in from the North Pole to help us out. We needed his unmistakable suit to pull off the proposal. 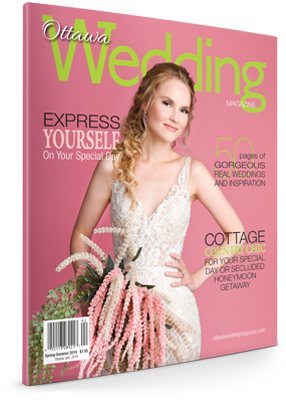 Next, a beautiful bride was outfitted in a gorgeous gown by Sinders Bridal of Carleton Place, a vintage fur cape from Angelina Wrona of Merrickville complemented the whimsical romantic look, and the boots? Oh, the boots! Shipped from The House of Elliot in the United Kingdom, they completed the ensemble. All we needed was the groom-to-be (disguised in Santa’s borrowed suit) to pop the question and present the ring. A 6.74 carat hessonite garnet, surrounded by diamonds and set in rose gold, had been lovingly crafted by Goldart Jewellery Studio of Ottawa. The scene was set, the outdoor living room warm and cozy with a fire burning in the pot-bellied stove, and the GypsyRose Bar serving up drinks by Top Shelf Distillers to keep things festive. 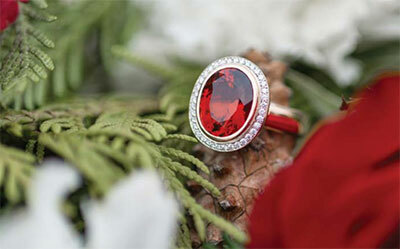 Flowers and greenery were everywhere with glorious pops of red to complement the ring. The invitations sent, the guests were soon to arrive at this surprise proposal party. Then “Santa” appeared, dropped on bended knee, and proposed to his lady with the beautiful ring in his hand. Little Miss Olivia, spying Santa, couldn’t contain her excitement to catch him kissing her mommy.